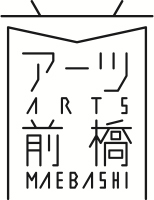 Tickets：Adult ￥500(300), University students and over 65 years old ￥300. Fares in brackets are rates for group of 10 or more. Free entrance for high school students and Under. Free entrance on 8 March for “International Day for the Elimination of Racial Discrimination”. This exhibition contains about 400 works and is the first large-scale exhibition on Asia’s woodcut movements in the world. The exhibition seeks to articulate how woodcut was developed in Asia and how this small yet important media played a role in the social and historical context of the region. You can create woodcuts (woodblock prints) with handy and cheap materials, and print as many copies as you like, so that you can convey your feeling and report what happens around you. The audience will grow by posting prints, hanging posters, and reproducing the images in publications. Thus the woodcut is a ‘democratic’ media both for creator and audience, which far exceeds the common presentation of artwork—the woodcut is a pioneer of today’s SNS. 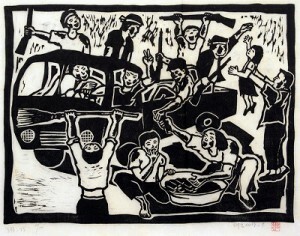 Woodcut as a ‘democratic’ media was often created and disseminated in political and social movements in Asian cities, such as those for independence from colonial rule, democratization against the dictatorship, reformation of labor situation, and the protest against environmental pollution. 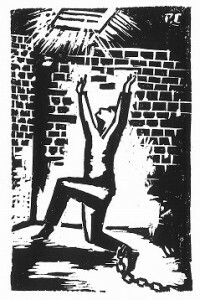 The woodcut has contributed in such activisms by conveying the hardship of people, disclosing problems of societies, seeking the solidarity with other communities, and mobilizing actions for better societies. Carving on wooden board produces white light on black background in printing. The woodcut as such has been an appropriate media for people who seek freedom and independence from the sheer darkness of societies. The history of woodcut in Asian cities does not only represent agony, struggle, or propaganda—it is a history of liberation in the subjective expression of oppressed people. The cultural and ethnic diversities in Asian traditional societies, as well as ideological gaps after the 20th Century, caused uncountable divisions and confrontations both domestically and internationally, which led to omnipresent tragedies. 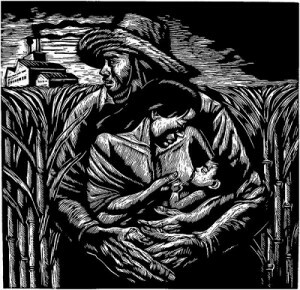 The woodcut has contributed in connecting people who lived in different communities but shared the problems far earlier than the globalization, not merely as cultural exchanges but also as a network of sympathy. 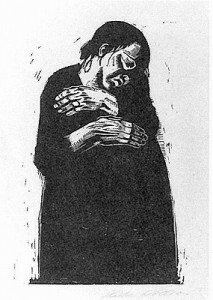 Lu Xun introduced modern woodcuts by Käthe Kollwitz and other European artists in Shanghai, which formed a basis for emerging woodcut movement. 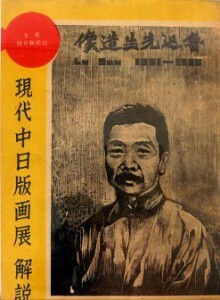 Promoted by Lu Xun, modern woodcut developed among young Chinese artists in Shanghai, and the movements spread to other cities. In Japan, the proletarian art movement explored the popularization of art. Postwar expectation for democracy revitalized woodcut movements in North Kanto region (northern outskirt of Tokyo). More than 200 exhibitions of Chinese woodcuts were held in Japan. Workers and regional communities engaged in woodcuts in circle activities. Woodcuts depicting anti-imperialism movements and peasant movements were created in Bengal (today’s West Bengal [India] and Bangladesh). 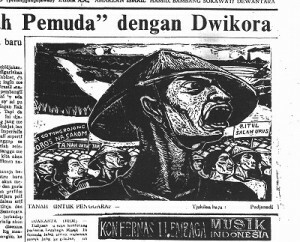 An Indonesian newspaper introduced woodcuts from Asian cities as a part of national policy to enhance Third World solidarity during the Cold War period. Chinese artists in Singapore with a strong sense of attachment to the mainland started to find new identities in local life in a Nanyang (tropical) city. 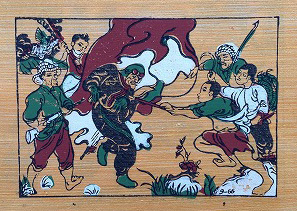 Vietnamese folk prints depicted war subjects; a Chinese print was copied in Pakistan and the United States, as an icon of the anti-imperialism and woman’s liberation struggles. Kaisahan (Unity) and other artists’ groups formed in the late 70s supported the struggles of laborers and farmers against President Marcos’ dictatorship. The Gwangju Democratization Movement in May 1980 triggered nationwide protest against the dictatorship. 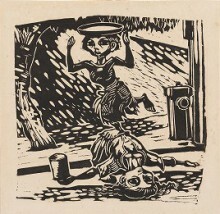 In this movement, Minjung Misul (People’s Art) developed, giving woodcuts crucial roles in an enlarged picture for rallies and demonstrations, publication, outreach program, etc. Collectives formed around the collapse of the Suharto regime in 1998 accused politician’s corruption and environmental crisis and supported farmers’ and fishermen’s struggles. 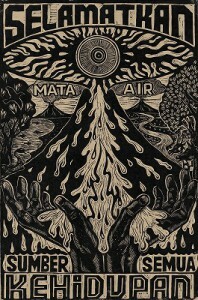 With their DIY spirit, woodcuts as media revitalized, influencing artists in other parts of Asia. Within the thought of seeking the change of society, the woodcut print movement constantly found its way into people’s lives and, as it brought the everyday person in, it was spread out. Even in recent years, a movement that can be called “Socially Engaged Art,” a movement which works to tackle social problems while working with people and the pressures on society and politics, can be seen regardless of country or region. This is not a one -side engagement, but rather it is distinctive reciprocal in which Social Interaction has come into existence. Irwan Ahmett and Tita Salina work and live in Jakarta, Indonesia. Studied Graphic Design at Jakarta Institute of Art (IKJ) and founded Ahmett Salina studio design and established for 16 years. Since 2010, they have produced self-initiative art projects focus on urban issue especially public space and make social and political issues as creative resources. 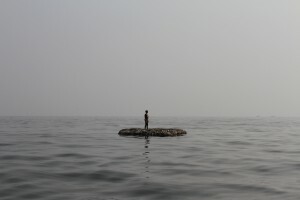 In the last five years, Irwan and Tita have created some art works, participated in collective art projects and invited to residency programs in Indonesia, Japan, The Netherlands, New Zealand, Norway, Germany and participated in Singapore Biennale, Setouchi Triennale, Asian Art Biennale, Jogja Biennale, Jakarta Biennale. We have discussed how we can solve the problem, but unfortunately Okin Collective was not able to participate the exhibition due to disagreement among the member.